There was a chronic shortage of currency in New France throughout the French Regime; coins brought out from the mother country returned almost immediately to France. Governor after governor pleaded with the French king to provide distinctive coins that would remain in the colony because they would be unacceptable in France. Finally in 1670 a supply of silver coins was provided, but no copper coins were shipped to meet the need for small change. Consideration was given to copper coins at this time and dies were prepared for a 2-denier piece. 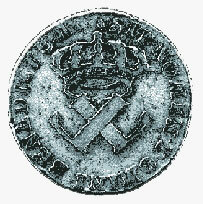 (The word "denier'' derives from "denarius" a small Roman coin which is referred to in the Bible as a penny.'') Although a few specimens were struck, there is no evidence that any ever reached Canada. In 1717 (47 years later) a further effort was made to produce copper coins for New France and other overseas French possessions, but again nothing came of it. Finally in 1721 a considerable quantity of 9-deniers pieces in copper were struck and shipped to Quebec and a further supply arrived in 1722. For some reason they proved to be unpopular with the inhabitants of New France and several years later the bulk of them still lay in a warehouse�perhaps the early settlers had grown accustomed to doing without small change. In any event no further shipments of copper coins were made to New France. The piece illustrated is part of the National Currency Collection, Bank of Canada.